Have you ever had one of those days where number sequences keep showing up? You look at the clock and see 4:44 or 3:33 or 1:11. A car pulls up in front of you, and there it is again, a license plate with 777 or 222. According to Doreen Virtue, PhD. 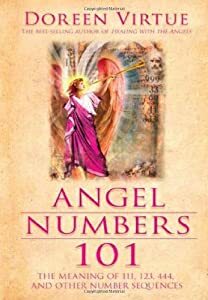 in her book Angel Numbers 101, repetitive number sequences have meaning and often bring messages from our angels. I have found, more often than not, that the code of reading angel numbers offers me simple amusement at times, but can also guide me in a joyful direction in life. This method of entertainment and guidance often puts a smile on my face and can turn my perspective in a positive direction. So, are you wondering what some of these numbers may mean? I will let you in on a few tips from Dr. Virtue’s book. However, there are 999 number combinations, and I don’t have them all memorized! But if you are interested in making new connections by using numbers, and you can keep an open mind about how your angels communicate with you, this may be fun and amazing for you. Here is the scoop on a few of the numbers you may see. 1 represents the idea of keeping your thoughts positive. Your thoughts are powerful, so be kind to yourself and think positively. 2 represents the idea of “keeping the faith.” Remember, when two or more are gathered in his name, he too is present. 3 represents the ascended masters, as in the holy trinity, including Christ. Know that the masters are with you and you are blessed. 4 is my favorite, for it represents the angels and acts as a reminder that they are always with you. When I see 444, I know that the creator is letting me know the angels are all around; a very comforting and joyful occurrence, which I am always grateful to acknowledge. 5 represents the idea that things are about to change for the better. Or it may appear to encourage you to speed ahead with an idea that you may be working on and hold on tight for new possibilities. 6 is a call to balance––to balance your day, your life, or even your checkbook. 8 is a number of abundance, fruition, and good fortune. And finally, 9 represents the idea of getting to work. More precisely, to work helping each other and focusing on the whole of humanity. A pretty big charge to take on, don’t you think? A noble and grand idea! The book has more details than I’ve included here, and it is a useful reference in my line of work. I have found that people welcome the book as a gift, as they enjoy looking up the sequences that appear in their lives most regularly. Of course, you don’t need a book to connect with your angels. All you need is a little faith and the knowing that we are blessed with many gifts from our creator, through whom all things are possible. So 111 to all of you, and 222. In other words, stay positive and keep the faith. I would like to order this book. I have tried but I dont know what I am doing wrong. Cant you help me? The book isn’t out yet. It is still in production. It may be 8 to 10 weeks before it is ready. I am just so excited to have come this far that I am sharing little pieces with all of you.